This new web-based online course is based on the public-access publication, Caring for a Person with Alzheimer’s Disease: Your Easy-to-Use Guide from the National Institute on Aging. 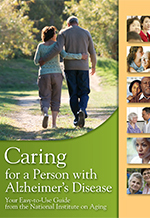 The booklet discusses practical issues concerning caring for someone with Alzheimer’s disease who has mild-to-moderate impairment, including a description of common challenges and coping strategies. Advice is provided regarding keeping the person safe, providing everyday care, adapting activities to suit their needs, and planning ahead for health, legal, and financial issues. Chapters also discuss self-care for caregivers, sources of assistance for caregivers in need, residential options for care, common medical issues, and end-of-life care. This course is relevant to clinicians who work with elderly individuals, their families, and their caretakers. ASHA credit expires 11/17/2014. ASHA CEUs are awarded by the ASHA CE Registry upon receipt of the quarterly completion report from the ASHA Approved CE Provider. Please note that the date that appears on ASHA transcripts is the last day of the quarter in which the course was completed. ASHA Provider #AAUM. This entry was posted in General and tagged ASHA, Caring for a Person with Alzheimer’s Disease, CE, CEUs, continuing education, Online Courses, Professional Development Resources, SLPs, Speech-Language Pathologists by Gina Gunderson. Bookmark the permalink.